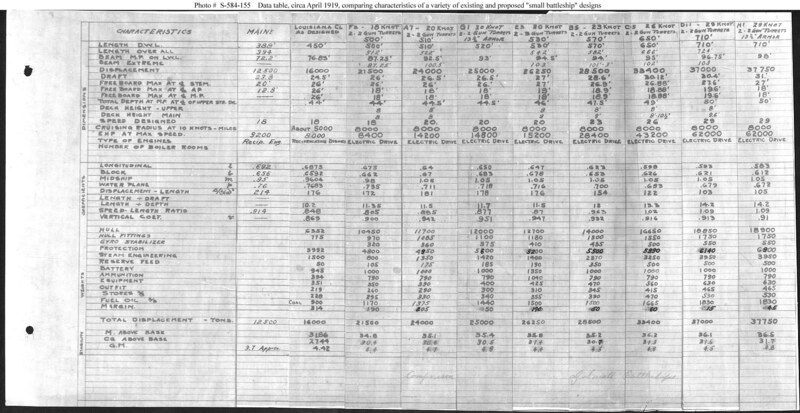 Comparative characteristics data for a series of preliminary designs for a "Small Battleship". The Chief of the Bureau of Construction and Repair requested on 8 March 1919 that his staff develop a set of comparative studies for ships of this type, apparently reflecting his desire to anticipate a possible early need for retrenchment from the large capital ship designs under development at the time. Additional designs in the "E" and "F" series were requested on 10 April, followed by "G" and "H" series variants with increased armor protection, on 17 April. The concept was not pursued. The data table provides technical characteristics for eight different "Small Battleship" design studies, compared to the data for battleships Maine (Battleship # 10) and Louisiana (Battleship # 19), earlier battleships built with two main battery gun turrets.